Martin Shervington is today’s featured guest. 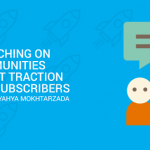 He explains how he managed to understand Google plus to hack into his community and grow his business and website traffic from it. Every person will have a different channel. It will depend on where your audience hangs out, so the key takeaway is understanding the ins and outs of the platform where your audience hangs out.